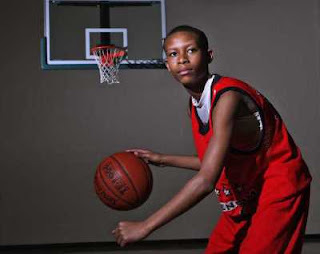 BASKETBALL SPOTLIGHT NEWS: Inside The MDC 12 And Under: Dozier Receives "The Stamp"
Inside The MDC 12 And Under: Dozier Receives "The Stamp"
During my tenure of covering basketball I have come across several players that I have given “The Stamp”. “The Stamp” is an approval that I give to a player that I feel has some serious potential and at least is a High Major Division 1 prospect. This weekend Perry Dozier Jr. has received “The Stamp” from Basketball Spotlight. Other players that received “The Stamp” during their elementary years include Tyreke Evans (8Th), Dexter Strickland (8th) and Mike Gilchrist (7th). Dozier got the nod after showing the capacity crowd all facets of his game. Special players have the enact ability to make others better, get a clean look anytime they want and just impact a game with their mere presence. This kid has all those tools. Anybody in attendance that watched this kid play and understands the game knows actually what I’m talking about. He has the size, skill level and basketball IQ to go as far as he wants in this game. Young Fella, just keep working hard because you are just getting started. Not many teams can say they took home a Basketball Spotlight crown their first time out but the boys from Richmond, Virginia can. This squad ran through some tough teams to take home the Gold Ball! Now they feel they want a shot at Team Final. I think this would be a great match up and wished it could have happened at the MDC. Maybe I will write the AAU Nationals and request for them to be in the same pool. After the Basketball Spotlight Grand Finale Jaquan McKennon left the squad and many felt the Gauchos couldn’t rebound from this loss. This is no knock on the kid because I love his game but Coach Science weathered the storm and has led his team to some impressive victories. Since then they have won the “Show Me” Invitational, finished runner up at the MDC and won the Metropolitan AAU 12U crown. Keep up the good work Science! When Perry Dozier Jr. fouled out with 3 minutes remaining against the Linden Ballers the future looked bleak for the Columbia Slammers. Then Seventh Woods decided it was his time to shine. The 10 year old went on a scoring streak dropping 8 points in the final 2 minutes to help his get the win and advance to the semifinals. Brad Hawkins of Team Final used the MDC as his coming out party by shattering the tournament scoring record of 31 points held by Dion Waiters. Hawkins lit up Team Underrated for 35 markers including 3 treys in their pool victory. On this day Hawkins was feeling it and was virtually unstoppable. Way to go Brad! Inside The MDC 14 And Under Division: Who's #1? Basketball Spotlight Headed to Hall Of Fame!